It's been a while since I did a Favorites Post, and because I recently went through and watched the entire series of Firefly, I thought I'd give that an entry. Now, if you're not familiar with the cult series, it was a sci-fi western that ran only fourteen episodes before FOX canceled it. Creator Joss Whedon was notably very upset about the show not thriving, though he was able to make a film to wrap up things a little bit. Firefly has grown in followers over the years, and there was a huge to-do for it at Comic-Con last year. It was only after that, in fact, that I realized I must cave and watch this series. I liked it but didn't love it, so thankfully it was short. Anyway, I thought I'd mention my favorite thing about each of the episodes today, rather than my typical routine of going through and picking the best episode from each season. I'm going with the chronological order to the story, not the order in which the episodes first appeared (a very possible reason as to why the show didn't do that well when it originally aired). 1. 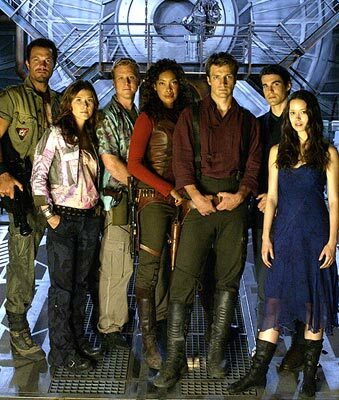 "Serenity" This is not one of the best episodes, in my opinion, which may be the reason FOX chose not to air it first, though it does a great job of explaining who is who and how they ended up on this particular spaceship. My favorite scene is actually the flashback to war times - you really get a sense of Zoe's commitment to Mal. 2. "The Train Job" This episode definitely embraces the "sci-fi western" theme, which is why I think it aired first. It also showcases how "weird" River can be, with her "two by two, hands of blue" repeated rhyme, which is definitely the part of the episodes that intrigued me most. 3. "Bushwhacked" I was dying to understand Reavers from the moment I began watching this series, and was surprised to learn that television viewers never really got the full effect - they'd have to wait for the movie for that! In this episode, however, we only get a sparse introduction. Never fear, though... my favorite part was actually Simon and River hiding outside the ship! 4. "Shindig" The ball is my favorite, of course! Kaylee might not have known what she was doing at such a fancy event, but I loved watching her throughout it. 5. "Safe" My problem with this episode is that it really starts getting me fired up about Shepherd, for whom we never get a full backstory. On the flip side, my favorite part of this episode is how much we learn about Simon and River's past, from the time they played as children until Simon fought with his parents, believing River was in danger. 6. "Our Mrs. Reynolds" Back to the western idea again. On a related note, it's not high up on my list. However, I really liked the idea of Inara and Mal being a couple, and this episode truly shows her caring about him when she kisses him. Rarely is a romantic scene my favorite, but he was unconscious because of poison anyway. 7. "Jaynestown" I think this is the installment that I found most odd. The idea that Jayne is worshiped in a small village and didn't know about it astonishes me to a point. My favorite part of the episode, however, takes place on the ship, where River rewrites Shepherd's Bible! It was just so unexpected and funny. 8. "Out of Gas" This episode is so incredibly that I was frozen as I watched the events proceed. It's probably my favorite, as despite all of the edge-of-your-seat drama that takes place as Mal suffers from a lack of oxygen, we get so much great detail about the other characters, particularly Kaylee. 10. "War Stories" I'd be surprised if you went with something other than the scene where River demonstrates that she can shoot people without looking at them. The entire rescue mission was fairly impressive, but I think I'd be like Kaylee after experiencing it - fearful of what, exactly, River is capable of doing! 11. "Trash" I can't believe Saffron is back! And now married to someone else! I think the Robin Hood aspect appealed most to me - the gang working on an elaborate heist to steal from the rich and give to the poor. Of course, nothing is straightforward on this series, so there have to be some twists, and that's where things really get exciting - like overriding a trash chute, only to wind up with the trash pickup not going as planned. 12. "The Message" This was actually the first episode I saw, years ago when I was at my husband's family's house for the holidays. And, the one scene that stuck with me from that viewing wound up being my favorite... when Tracey wakes up from "being dead" and eventually admits that he is smuggling special organs in this body. Talk about the future of medicine! 13. "Heart of Gold" Definitely one of my least-favorite episodes (those heavy western elements kill me! ), this one takes place at a brothel where there's a pregnant Companion. The title of the episode really describes Mal - he'll take on a mission for Inara, and my favorite scene is the two of them together - neither wants to admit their feelings, but they're so present it's unmistakable. 14. "Objects in Space" The obvious and overstated favorite scene in this episode is toward the end, where River reveals that she's hiding on the enemy's ship. My favorite, however, is the fact that River goes around reading minds... I guess I had kind of figured that she could do it, but I was still surprised when she started demonstrating that ability almost continuously. AND, BONUS, the movie Serenity: This one is really easy for me. As someone who really wanted to learn more about the Reavers, my favorite part of the film was the log that the gang watches when they're on the uninhabited planet. It explains that the Alliance had wanted to chemically induce suppressed aggression, but not only did it go too far, some people had the opposite reaction, becoming the hyper-aggressive Reavers. Well, what were your favorite parts of Firefly?